14 " x 12" x 14"
Greetings! If you are a regular reader of this newsletter you have undoubtedly noticed that Lino Tagliapietra’s glass sculpture makes a monthly appearance here. This month, instead of featuring a new Lino piece (many wonderful Lino works can be seen here), I’ve decided to feature Lino himself. 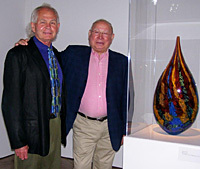 The image here was taken at Lino’s solo exhibition at the Museum of Glass in Tacoma, WA, which opened in July of 2012. Lino’s influence on the American studio glass movement cannot be exaggerated and has been written about extensively elsewhere. At age 79, Lino has literally been blowing glass professionally for more than 60 years. Any of you who have had the good fortune to meet Lino, or the even greater fortune of sharing a meal with him (Lino is a passionate connoisseur of great food and wine and is a joy to dine with), know that he is a vibrant, charming and extremely bright individual. His personality, like his work, has many facets. He has an extremely wide range of interests and knowledge yet his one great life-long passion has been and remains glass. He has taken glassblowing to a level unprecedented in the history of glass. I am honored to be one of Lino’s representatives and to call him a good friend! "Aurora Cloud" is an outstanding example of Nancy’s "Cloud" series. The soft, swirly lines of blue, aqua and lavender lend it a soft, cloud-like feeling that are in total keeping with its soft, curvy form. For some reason it gives me the same feeling as does the Irish landscape on what the Irish call a "soft day." I think that term means light and misty and mysterious. I have chosen a beautiful new piece by John Kiley to feature this month called "Winding Sphere." I love the curvilinear lines of this sculpture and the way that the two colors meet and blend into each other. There is an intensely fascinating visual dynamic between the outer surface of this piece and its intimate interior spaces. Of the American artists working in the realm of cast glass, one of my favorites is Latchezar Boyadjiev. One of the reasons behind this preference is that most of Latchezar’s forms are organic, curvy and sensual in contrast to the more geometric and rectilinear shapes many cast glass artists tend to create, especially those of an Eastern European background such as Latchezar has. This particular piece is a stunning orange which becomes darker or lighter depending upon the thickness of the glass. True to its title, the piece exudes a powerful energy and at the same time is gracious and inviting. Some of the previous years’ Studio Editions still are available in limited numbers. This one, "Misty Persian Pair" is from 2009. 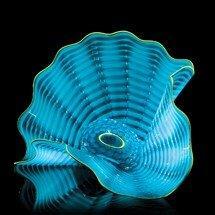 You may see all of Chihuly’s 2013 Studio Editions on this page and the 2012 ones here. If you’d like to see others from previous years just let me know. I chose to feature this one because I think it is very typical in feeling and form to the essence of the Persian series which is organic, graceful, light and a bit playful.